Her face seems to be a bit swollen and awfully tight, especially around the eyes and forehead area. I wonder if this is the result of botox injections, or perhaps an eye lift. I hope this isn't the case, seeing how Ms. Judd has been the reigning champ of the "all natural" celebrity actress club, for almost two decades. What do you think, has Ashley Judd had some type of plastic surgery? Not at all. She has been out of the public eye like she used to, so it seems to me she has gained some weight and she's the kind of person who gain in the cheeks and this make her look more swollen. That's the reason when she smiles looks like that, faces like her with rounded cheeks.. Besides, if you look at her photos, the wrinkles are there, so... the photos have not been the best and she has not wore the best looks fo her. No she did gain a little weight Ashley Judd Fan but that chick got some plastik up in dem cheeks lol she is soooooo tight it makes me uncomfortable!! Woah she use 2 be hot and even wit weight I've seen her she's hot but what did she do !! Yes I think she has, I just saw Toothfairy and the 1st thing I noticed was her fat face and asked my daughter if she had cheek implants done. just saw here on Joy Behar and clearly either she got a face lift and gained some weight in the face or she got a bad botox job. Her Left eyebrow is unnaturally high and arched. Too bad she felt the need to go this route. Please please do not do anything further to yourself, I did not even know who it was in the Toothfairy until I took the time to check the closing credits, even then I rewound the DVD to take a second look. She's gained a quite lot of weight. That may not be her fault. She's been very open about her battles with depression, and some of the medications used to fight it cause weight gain. I think that's basically what you're seeing. A little botox in the forehead, too--probably needed, if she's been fighting depression. But that will wear off, and the weight will come off, and--you'll see--she's still Ashley. You don't gain weight only in your face. She's had some really aggressive work done recently and looks awful. Ashley resemble the Joler from Batman on the latest People mag. I'm all for sympathizing when folks suffer from depression, but it does not give you the right to treat OTHER people badly. Judd has a long-standing reputation as being a world class jerk in real life. She definitely had work done. Her cheeks are puffy, her eyes squinty and her eyebrows are way too high. She looks almost exactly like her mother now (another plastic-face). ASHLEY!!!! WHY on earth would you want to go and mess with the natural beauty you had??? This looks very plastic..and not at all becoming. Sorry, but the "previous" you was so gorgeous, and now you have gone in the opposite direction. Wish you would have never done this. Why do these pretty women mess up their faces with botox, lifts, or whatever causes their freaky looks! Marie Osmond messed up her face also recently. 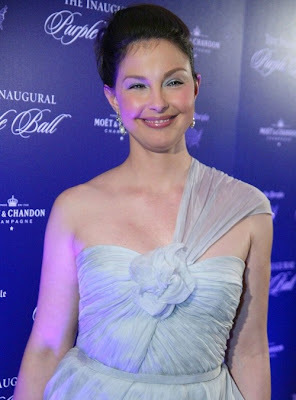 Ashley Judd does not look near as pretty as before and she should have left her hair longer or get a cuter short cut. That cut is not looking very great. Yes...something is definitely wrong with her left eye. I have been thinking about getting "light" botox for my worry lines between my brows, but not the whole 9 yards. It would be almost more preventative than cosmetic. Wonder what she went in for...? I have a friend from childhood that now looks like a cheek/chin implanted whole other person. It freaks me out!